Next to the form components, there are also 4 lay-out components available. 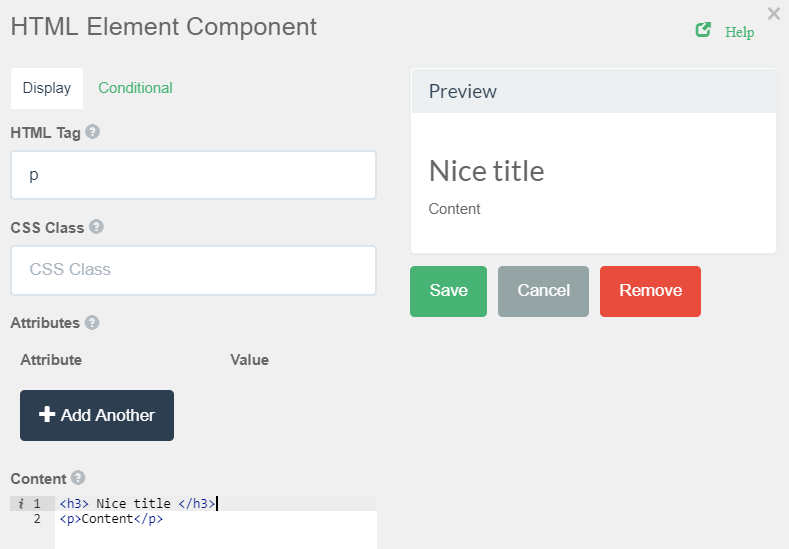 These components allow you to freshen up your form, add more text or columns or spread the content over several pages. Text can be added to a form to add extra text or instructions. Example 1: Add instructions at the top of a form that are for display only. Example 2: Add section titles to structure your form. There are no settings for a Content component and the value is not submitted back to the server. A WYSIWYG editor has been provided to help with formatting the content. If you use the HTML view of the editor, note that all unsafe HTML is stripped before rendering to prevent cross-site scripting exploits. An HTML component may be added to a form to display a single HTML element. This is useful if you wish to quickly insert and configure some HTML in your form. All unsafe HTML is stripped before rendering to prevent cross-site scripting exploits. The Column layout component can be used to split any area into two columns. Simply drag and drop the Column button onto the form and the area you drop it on will be split in two. A section can be used to create a title of an area of the form. This is useful to put inside Layout components or in between lots of related fields. The Tab component allows adding tabs to the same page. You can add different form components to each tab. The table component allows creating a table with columns and rows that allow adding additional components within it.